INTERMEDIATE: A wakeboarding session for 15 minutes will cost £30. This is only for people who have done it before, it is not long enough to learn. PROGRESSION: Alternatively if you want to be a pro or to get some practice in you can hire the boat for the hour for £100. This way you have the boat to yourself and a one to one lesson from the instuctor. Please note, unless we already have our boat at sea, we require a min of £100 booking to launch. and alternatively just to relax and sunbath. 6 people max are available on the boat at one time, but we can always split larger groups. Check out our package deals if you have a big group and everybody wants to stay entertained. If your group is over 6, you may want to consider our half day watersports package so that eveyone can stay involved in an activity throughout. 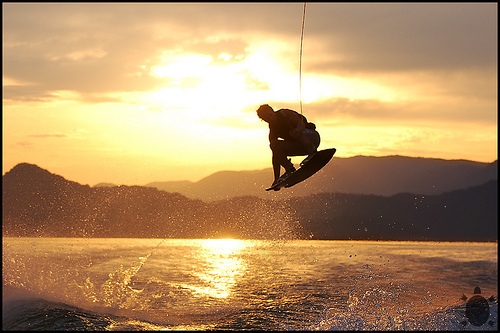 Wakeboarding is a surface watersport which involves riding a wakeboard over the surface of a body of water. It was developed from a combination of water-skiing, snow boarding and surfing techniques. Using edging techniques, the rider can move outside of the wake or cut rapidly in toward the wake. Jumps are performed by hitting the wake and launching into the air. 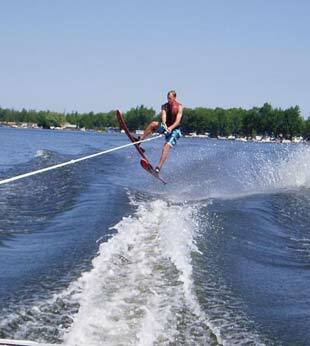 Waterskiing is a sport where an individual is typically pulled behind a boat or a cable ski installation on a body of water, skimming the surface. The sport usually begins with a deep water start, with the skier crouching down in the water. When the skier is ready, the driver accelerates the boat to pull the skier out of the water. If you are interested in booking or would like some more information please call the shop. We also have gift voucher available for Wakeboarding/Waterskiing which we can get posted out to you.